Check the start/end of each working day, manage schedules and estimate time and productivity of full or part-time staff. Observe where time goes, what activities consume most of that time and most importantly, can you improve your performance? Quick reminders about the latest reports on productivity directly on your phone. Stay up to date wherever you are. 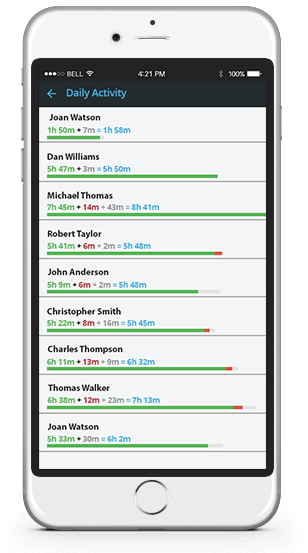 Check which tools keep you busy throughout the day and see how much time you spend on each application. Analyze the ratio of productive/unproductive/neutral time to quickly enhance the dynamics of performance and increase productivity. Inclusive, easy-to-read reports on productivity on one easy to use online platform. Measure and improve everything.